Clayton Christensen recently tweeted that “any strategy is (at best) only temporarily correct.” The paradox behind this statement is that great managers hyper-optimize their business lines for profit only to see new entrants come in to take all the money off the table. This type of perfect competition can shoot a company off the edge of a cliff. Creative disruption a la Apple and Amazon is the answer, but little is discussed of startups catapulting their own successes into new markets. We usually only hear of the overnight success stories like Facebook. But with technology change reaching tornado speed and the pathway from David to Goliath longer than ever, change is important for startups to embrace early and often. For entrepreneurs eager to endure in the competitive and complicated markets of enterprise software, I’d like to offer up an anecdote of our portfolio company vArmour evolving its platform strategy for a new sprint at competitive advantage in the security software industry. This is one of the most common painpoints I hear, across the fastest growing VC-backed enterprise startups we work with and the globally distributed Fortune 1000 corporations in our corporate network: managing people is hard. And yet there are still surprisingly few technology products that have served this people manager and leadership development training space, estimated to hit $13.8B in 2020 (here), which to date still revolves largely around in-person trainings and workshops. Given the rise of AI across a range of verticals: financial services, life sciences, healthcare, energy, transportation, heavy industry, agriculture, and materials — we have yet to see AI broadly applied to the people manager training space (though there are some early startups tackling this space, as detailed in my slides above). With New York City’s rich history of data science across diverse industries, it is no surprise that our New York R Conference has grown into one of NYC's top data science conferences. Every April, we welcome a sold-out crowd of over 300 people for 2 full days of leading talks from some of the best data scientists in the world, connecting diverse domains and industries from the world's leading startups to Fortune 1000s and academia. Check out all of the talks and slides, now live on the R Conference website. Co-hosted with our friends at Lander Analytics and now in its 3rd consecutive year, our conference spanned 25 sessions, covering prominent themes like how to incorporate R into current workflows, the latest and greatest developments around the language, the best use-cases for analyses, and the insights gained from novel data sets. 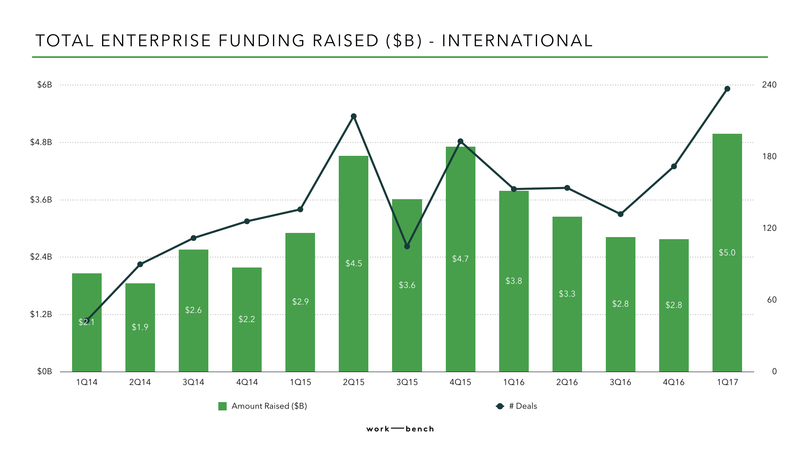 After a lackluster year for enterprise technology venture capital investments, 2017 kicked off with a record breaking quarter for enterprise technology startups. Following 4 straight quarters of decreasing investment, investors poured a record-breaking $5 billion dollars into enterprise technology startups in the first quarter of 2017 alone – a nearly 80% increase from the previous quarter – across a record number of 237 deals. These enterprise startups – solving problems for world’s largest companies around data & analytics, cloud-native infrastructure, cybersecurity, and AI-powered business applications for the future workplace – are building businesses by capturing some of the close to $3.5 trillion that the Global 1000 and Fortune 500 spend every year on software and technology. And they’re having a moment. Coming on the heels of Cisco’s massive $3.7B acquisition of AppDynamics right before their public offering earlier this year – and MuleSoft’s 45 percent pop on their first day of trading two weeks ago – enterprise is clearly in vogue. With Alteryx’s IPO last week, there’s still a robust lineup of enterprise exits coming down the pipeline, including Presido, Okta, and Yext, who have all filed S-1s in preparation of an IPO, and speculation from many more including Cloudera, DocuSign, Domo, and Tenable Network Security.